LONDON--(BUSINESS WIRE)--Technavio analysts forecast the global vending machine market to grow at a CAGR of close to 17% during the forecast period, according to their latest market research report. The rise in the adoption of intelligent vending machines is one of the major trends being witnessed in the global vending machine market 2019-2023. Unlike conventional vending machines that just dispense products, intelligent vending machines have advanced features such as operations and inventory management, customer analytics, transaction management, software and platform management, and digital advertising and content management systems. Internet-enabled data collection software is used to gather information about a customer by these vending machines. Furthermore, by collecting, transferring, and analyzing data, intelligent vending machines enable retailers to focus on their core competencies of timely distribution and product quality. In addition, they also help in tracking real-time operational data such as daily sales, footfalls, and inventory levels. Hence, the global vending machines market is expected to witness a significant surge in the adoption of intelligent vending machines during the forecast period. There has been an exponential increase in cashless and digital modes of transactions over the past five years. The momentous increase in smartphone and internet penetration, the emergence of numerous digital wallet and e-commerce payment systems, user-friendly instant e-transfer services offered by banks, and the rise in credit and debit card usage are factors contributing to the growth of digital and cashless transactions. The burgeoning trend in digital and cashless payments has prompted retailers to install vending machines that accept such payments to increase sales and enhance customer convenience. Further, various digital and cashless payment vendors are providing additional discounts, cashback, and many other offers to attract more consumers and enhance adoption rates. These factors are expected to give a strong fillip to the global vending machines market during the forecast period. The global vending machine market research report provides market segmentation by product (low-end vending machines and intelligent vending machines) and by region (the Americas, EMEA, and APAC). It provides an in-depth analysis of the prominent factors influencing the market, including drivers, opportunities, trends, and industry-specific challenges. The Americas held the largest share of the market in 2018, accounting for over 42% share, followed by the EMEA and APAC respectively. Although APAC held the smallest share of the market, it is expected to witness the maximum increase in its market share over the forecast period due to Japan, China, and South Korea being the major contributors to the vending machine market in APAC. 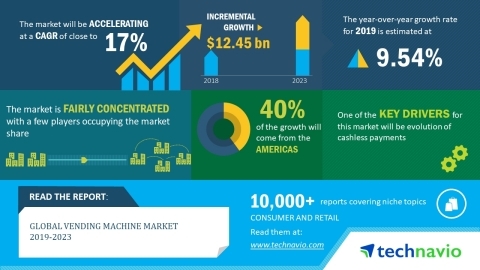 Technavio analysts forecast the global vending machine market to grow at a CAGR of close to 17% during the forecast period, 2019-2023.